What is the difference between virtual reality, augmented reality and mixed reality? originally appeared on Quora: the place to gain and share knowledge, empowering people to learn from others and better understand the world. Not clear? Let’s go deeper into details. This technology immerses users in a completely virtual environment that is generated by a computer. The most advanced VR experiences even provide freedom of movement – users can move in a digital environment and hear sounds. Moreover, special hand controllers can be used to enhance VR experiences. You need to wear a special VR headset to experience virtual reality. Most VR headsets are connected to a computer (Oculus Rift) or a gaming console (PlayStation VR) but there are standalone devices (Google Cardboard is among the most popular) as well. Most standalone VR headsets work in combination with smartphones – you insert a smartphone, wear a headset, and immerse in the virtual reality. Have you ever noticed a small cardboard icon when watching videos on YouTube? It enables the 360-degree mode that means you can wear a VR headset and experiences fully immersive videos. 360-degree videos are considered a form of VR. In augmented reality, users see and interact with the real world while digital content is added to it. If this sounds unclear think of Pokemon Go – millions of people all over the world have been rushing with their smartphones in search for small virtual creatures. That’s the most vivid example of augmented reality. If you own a modern smartphone, you can easily download an AR app and try this technology. There’s a different way to experience augmented reality, though – with special AR headsets, such as Google Glass, where digital content is displayed on a tiny screen in front of a user’s eye. Mixed reality that starts with the real world – virtual objects are not just overlaid on the real world but can interact with it. In this case, a user remains in the real-world environment while digital content is added to it; moreover, a user can interact with virtual objects. This form of mixed reality can be considered an advanced form of AR. If you can’t figure out how this works, take a look at how Skype is used on Microsoft HoloLens. Mixed reality that starts with the virtual world – the digital environment is anchored to and replaces the real world. In this case, a user is fully immersed in the virtual environment while the real world is blocked out. Sounds like virtual reality, right? In fact it does, but the digital objects overlap the real ones whereas in conventional VR the virtual environment isn’t connected to the real world around a user. To experience this form of mixed reality, you can wear Windows mixed reality headsets. Here’s an example of how it all works. 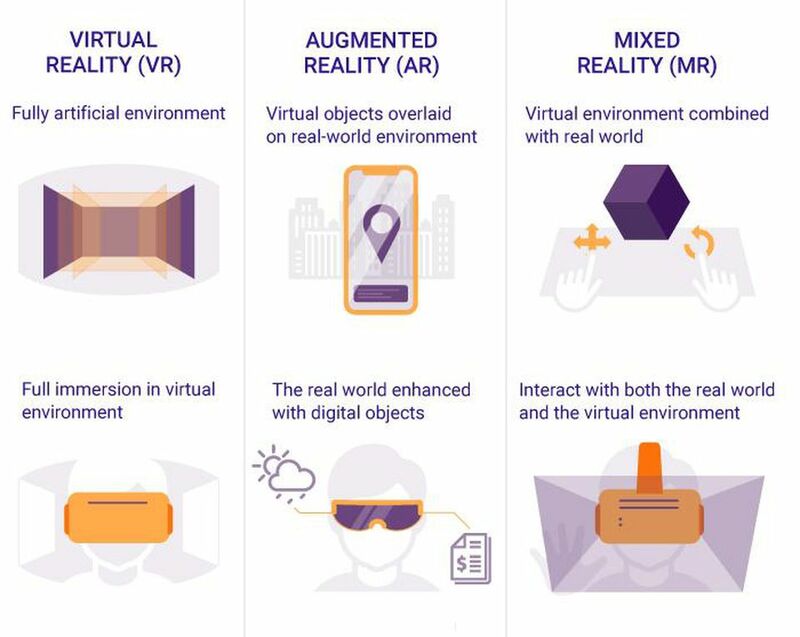 If you want to learn more about VR, AR, and MR as well as find out what devices you need to experience these technologies, have a look at this article. It will help you better understand how these technologies work and – more importantly – how businesses can apply them.